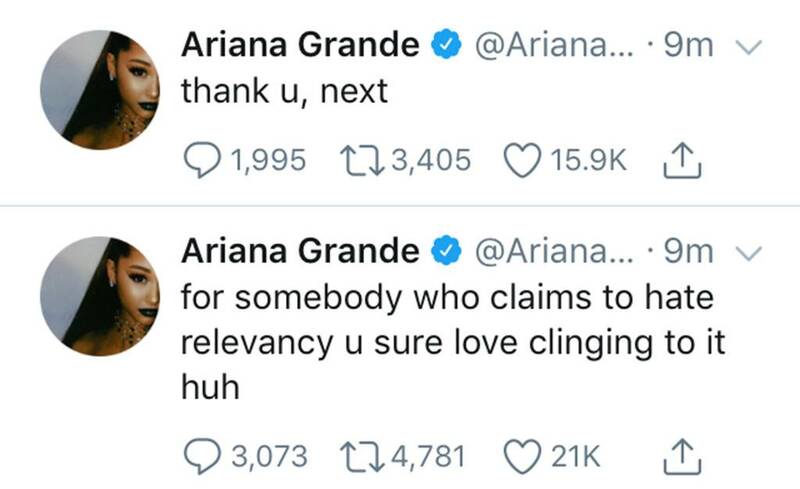 Ariana Grande clearly doesn’t want her name uttered out of Pete Davidson’s mouth. The Saturday Night Live star didn’t explicitly say the singer’s name, but from the looks of the teaser Davidson clearly referenced their short-lived engagement when he proposed to Maggie Rogers shortly after meeting her. Downplaying their relationship did not sit well with Ariana, who took to Twitter on Thursday with the sharpest clap back. The “God Is a Woman” pop star didn’t call Davidson out, however a few other fan tweets that Ariana engaged with made her target clear as day. The 25-year-old pop star is gradually separating herself from Davidson since their split in mid-October. Ariana Grande concealed two of their matching tattoos and is gearing up to take off on her Sweetener World Tour in 2019.